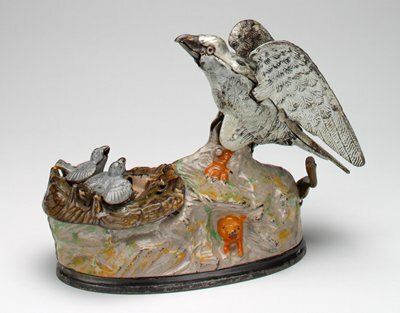 The impulse to connect events in the news to works of art in museums is common among art museum educators, and the Minneapolis Institute of Arts has created a team to bring that impulse to life. 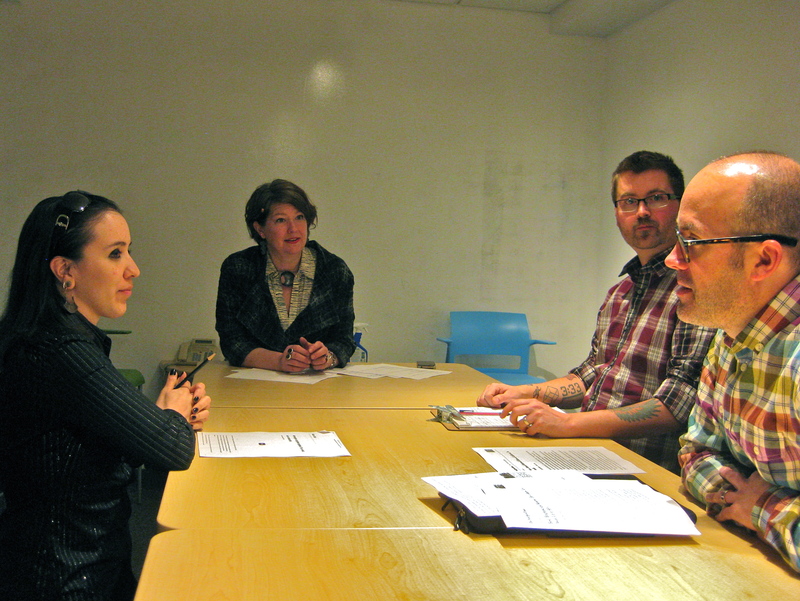 Every Wednesday in the NewsRoom, a conference room lined with white boards and specially named for this project, a rotating group of attendees hosted by editor Diane Richard stand around a table sharing ideas in a pitch-style meeting. Pictured is a group of five from a recent Wednesday, but there are frequently more than ten people around the table pitching ideas. This half hour meeting is a place for any staff member to pitch a “News Flash,” a label that highlights the relationship between the museum’s collection and current events. “News Flash” labels “make that connection of the relevance of the collection to our viewer,” explains Diane Richard. 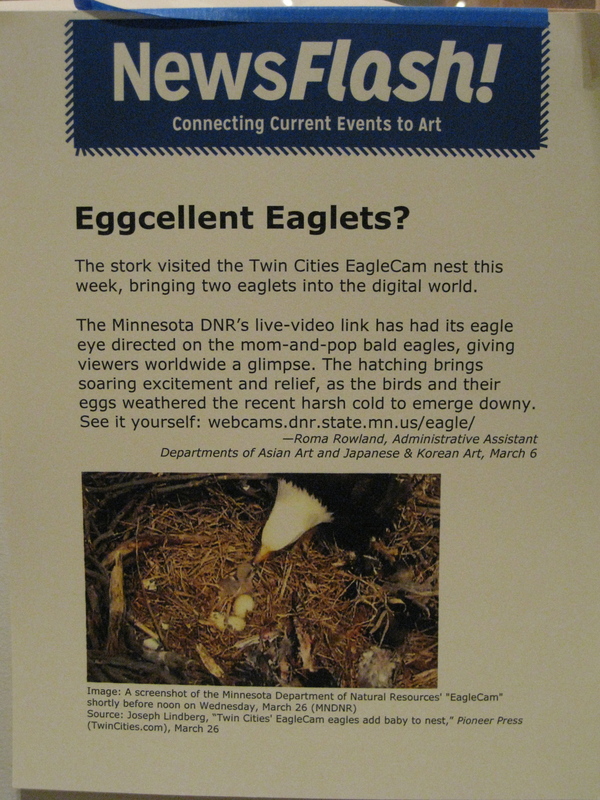 With a large collection spanning 40,000 years from all corners of the world, the connections can range from the Twin Cities EagleCam capturing baby Eaglets to political and economic conflicts around the world. 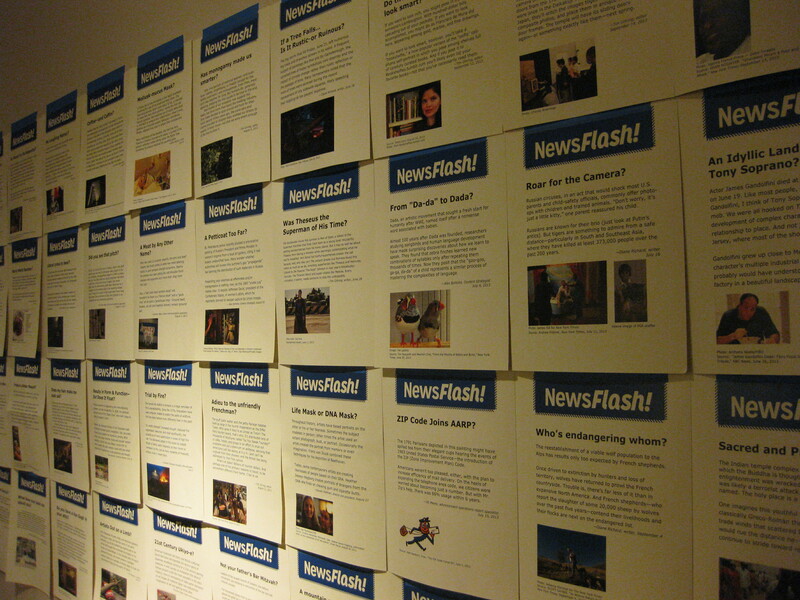 Wall displaying past “News Flash” labels. On this particular Wednesday, Roma Rowland brought in an article about a man who captured what he thought was a falling meteor with his GoPro camera while parachuting out of a plane. This label will be paired with Jennifer Steinkamp’s 6EQUJ5, a projection of “intelligent asteroids” on the domed ceiling of the museum’s Target Wing. The museum-wide initiative began with the active support of Director Kaywin Feldman and is now run by Diane Richard and Alex Bortolot, content strategist for curatorial content. The approach is simple. Anyone —administrative assistant, curator or guard—with an idea for a label that connects a work of art to current events in the news pitches the idea at the weekly meeting. If the pitch is successful a short label is written and sent to editorial, and it’s edited the same day. It’s printed on a template and the writer gets the honor of taping the label to the gallery wall next to the work of art with removal blue tape, a signal of its temporary nature. “News Flashes” stay up for a quick two weeks to make sure each connection is timely and relevant. The labels have provoked a variety of responses from viewers. “I’ve heard people say they see a news flash label and they go shooting toward that object. It’s because it taps into something else that’s going on in people’s heads outside of this sanctuary,” says Richard. Bringing to life the notion that no matter what century a work of art originated in, museums can help visitors connect it to the world around us right now.